This album spread features to of the last engagement photos we took in Distillery District during this shoot. 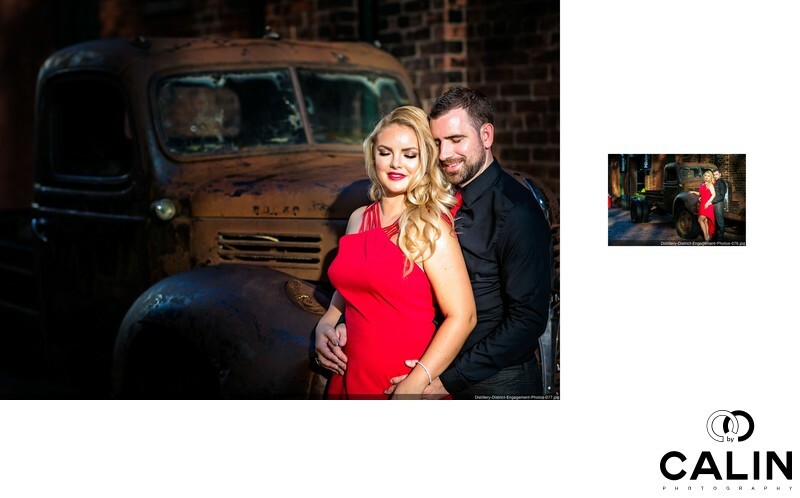 The picture on the left shows the engaged couple hugging in front of an old truck. Both Katerina and Taylor are smiling in this photo. The picture on the right was taking the same spot and is a wider crop of the same image. The most striking element of these photos is the light. There is a beam of light shining onto the couple which makes it look like seen in an old Hollywood movie. The old rusty truck and the brick wall behind the couple contribute to the cinematic look of these engagement pictures. Location: 21 Gristmill Lane, Toronto, ON M5A 3C4.